Despite some pretty significant security concerns, everyone's favorite futurific company VeriChip is looking to get its chips under the skin of the largest group of people yet: the entire US military. 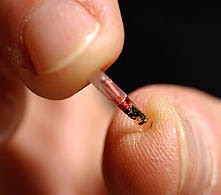 According to the DC Examiner, the company is lobbying the Pentagon to choose its RFID tags as a replacement for the famous metal dog tags, making information like a person's name and complete medical record instantly available with the swipe of an RFID reader. Needless to say, not everyone's sold on the idea, with veterans' groups and some members of Congress already raising concerns. There doesn't seem to be any indication as to when a decision might be made, although given VeriChip's political connections, we wouldn't be so quick to bet against it.